Our Under 18's took their season tally to three wins after a tough fought 8.12 (60) to 7.0 (42) win over the Eagles in Round 3. In trying conditions we travelled to Woodville Oval to play the Eagles on Saturday. After missing some early opportunities, it took us until 16 minutes into the first quarter for Darnell Tucker to kick our first goal. We then allowed the Eagles to kick one straight away before giving up a late goal to go into quarter time three points down. We had a good second quarter driven by Luke Bogle, Darnell Tucker and Hayden Sampson getting a bit of the ball and Tucker kicking two goals. This meant the team kicked 4.1 to 1.0 for the term and gave us a 21-point lead going into halftime. Our third quarter saw us miss multiple opportunities and not be able to convert as well as we would like kicking 2.3 and when the Eagles kicked 4 straight goals. This meant our lead was reduced to nine point heading into the last quarter. We came out strong in the final term, kicking an early goal in the first two minutes. It felt like we controlled the game and played it in our forward half, but we were not able to convert on our inside 50 opportunities. Our defence had a strong last quarter and didn't let the Eagles score to give us an 18-point win, which we were very happy with. 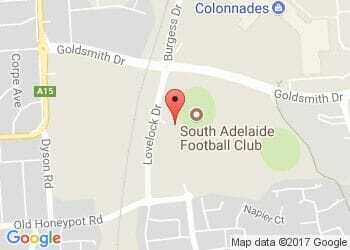 This Sunday we travel to Glenelg to play West Adelaide who are due for a win, so we are expecting another hard game. Head down and show your support for the boys. First bounce is at 2:00pm! South Adelaide's Under-16s bounced back in Round 5 with a 6.15 (51) to 5.7 (37) win over Woodville-West Torrens at Maughan Thiem Hyundai Oval on Saturday afternoon. After a disappointing loss last week against Norwood was going to be important to get off to a fast start against the bottom-placed Eagles in trying conditions. However, kicking with the aid of a slight breeze the Eagles dominated the quarter kicking three goals to one. Our intensity and pressure around the contest was not at the standard we needed. From the first bounce of the second quarter we could tell straight away that we had lifted our pressure and started hunting the ball and managed to come in at halftime with a goal lead. During the second half we controlled the game eventually winning by 14 points. This was an excellent learning experience for the players and showed if you don't have the right mind set at this level opposition teams will punish you. We look forward to tackline Westies at Gliderol Stadium (no not a typo!) this Sunday at 4:30pm.